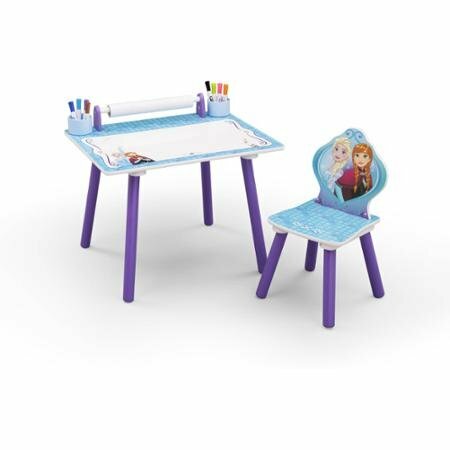 Provide an aspiring artist with a charming area to do homework, create crafts or draw with this Delta Children Disney Frozen Art Desk. It is made of durable engineered wood and solid wood and features a spacious tabletop with a dry-erase surface for added fun. This kids' desk and chair set has an attached paper roller and printed rolled paper with ready-to-color Frozen images. It has a scratch-resistant finish that protects the brightly colored Anna and Elsa graphics. It is equipped with built-in areas for storing markers, pens, crayons, pencils and more. This Delta Children's desk requires some easy assembly and meets or exceeds all CPSC safety standards. It will hold up to 50 lbs and is recommended for children age 3 to 6.